Genetic algorithms are playing an increasingly important role in studies of complex adaptive systems, ranging from adaptive agents in economic theory to the use of machine learning techniques in the design of complex devices such as aircraft turbines and integrated circuits. 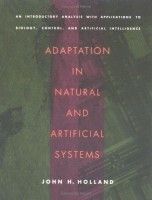 Adaptation in Natural and Artificial Systems is the book that initiated this field of study, presenting the theoretical foundations and exploring applications.In its most familiar form, adaptation is a biological process, whereby organisms evolve by rearranging genetic material to survive in environments confronting them. In this now classic work, Holland presents a mathematical model that allows for the nonlinearity of such complex interactions. He demonstrates the model’s universality by applying it to economics, physiological psychology, game theory, and artificial intelligence and then outlines the way in which this approach modifies the traditional views of mathematical genetics.Initially applying his concepts to simply defined artificial systems with limited numbers of parameters, Holland goes on to explore their use in the study of a wide range of complex, naturally occuring processes, concentrating on systems having multiple factors that interact in nonlinear ways. Along the way he accounts for major effects of coadaptation and coevolution: the emergence of building blocks, or schemata, that are recombined and passed on to succeeding generations to provide, innovations and improvements.John H. Holland is Professor of Psychology and Professor of Electrical Engineering and Computer Science at the University of Michigan. He is also Maxwell Professor at the Santa Fe Institute and is Director of the University of Michigan/Santa Fe Institute Advanced Research Program.